Playing without injured Kevin Durant, the Golden State Warriors snapped Houston's nine-game win streak and avoided being swept this season by the Rockets with a 106-104 road victory Wednesday. 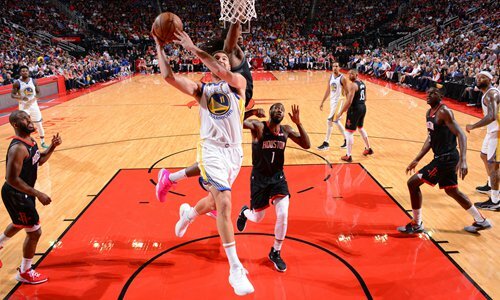 Klay Thompson scored a game-high 30 points while DeMarcus Cousins netted a season-high 27 points plus team highs of eight rebounds and seven assists and Stephen Curry contributed 24 points in a crucial victory for the defending champions. "When Kevin is out, we don't have the luxury of throwing to him and getting 30 points," Thompson said. "We had to throw it to 'Boogie' [Collins] in the post and he came through for us in a big way. He propelled us to a victory tonight." But the Warriors, a Western Conference-best 46-21, bounced back behind three-point sharpshooter Thompson, who hit 12-of-23 from the floor including five-of-10 from beyond the arc. "We made a concerted effort to feed him in the post," Curry said. "Nothing he does out there should surprise anybody." Houston, which led Golden State 3-2 in last year's Western Conference finals before falling in seven games, had won the first three meetings of the season with Golden State but could not become the first team to sweep the Warriors since Steve Kerr became coach of the club and their run of four consecutive NBA Finals runs began. NBA scoring leader James Harden netted 29 points and added 10 assists to lead the Rockets (42-26), who also got 24 points from Chris Paul and 13 points and 13 rebounds from Clint ­Capela. Paul sank two free throws with 47 seconds remaining to pull Houston within 104-100, then completed a three-point play after being fouled by Andre Iguodala to pull the Rockets within 104-103 with 10 seconds remaining. Elsewhere, Russell Westbrook unleashed his 26th triple-double of the season and led a second-half surge that lifted the Oklahoma City Thunder over visiting Brooklyn 108-96. Westbrook finished with 31 points, 12 rebounds, 11 assists and three steals while the Thunder's Paul George and Brooklyn's Spencer Dinwiddie each added 25 points. The Nets led 52-42 at halftime but could not silence the Thunder in the second half. Miami improved to 32-35, tightening the Heat's grip on the eighth and last Eastern ­Conference playoff berth to two games over ­Orlando and Charlotte with Washington 3.5 adrift.